Mt. Etna is back with a bang as locals were treated to an awesome display of nature’s power after the latest eruption lit up the Sicilian sky. As well as dominating the skyline in Sicily, Mt Etna is Europe’s highest and most active volcano, according to Italy's National Institute of Geophysics and Volcanology (INGV). Monday night’s eruption, which began in the south east crater, didn’t disappoint onlookers and was visible from the nearby cities of Catania and Taormina. Volcanologists describe it as a ‘Strombolian’ eruption, characterized by intermittent bursts of lava that can reach heights of several hundred meters as a result of trapped bubbles of gas escaping through the lava. These volcanoes are particularly closely studied given their history of violent eruptions, high levels of ongoing activity and their proximity to population centers. 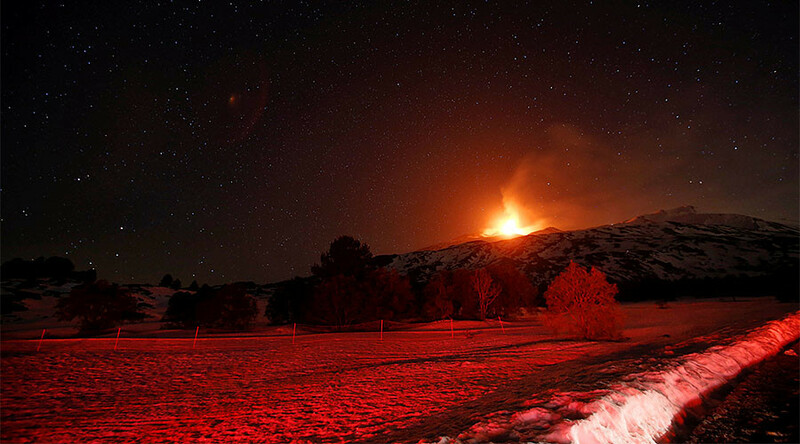 While such eruptions are surprisingly common on Etna, they do not pose any direct threat to the local inhabitants just yet, according to INGV. The local airport in Catania has remained open, reports the Local. A livestream of the volcano can be viewed here.